Change, Hope & Justice is EAPN's latest handbook which aims to strengthen members’ capacity to act against poverty and Human Rights violations. It is hoped that the Handbook will inspire organisations - but also Governments, National Human Rights Institutes and Equality Bodies, & public, private and not-for-profit service providers - to include Human Rights as the basis and aim of their work, as a new lens to look at poverty. 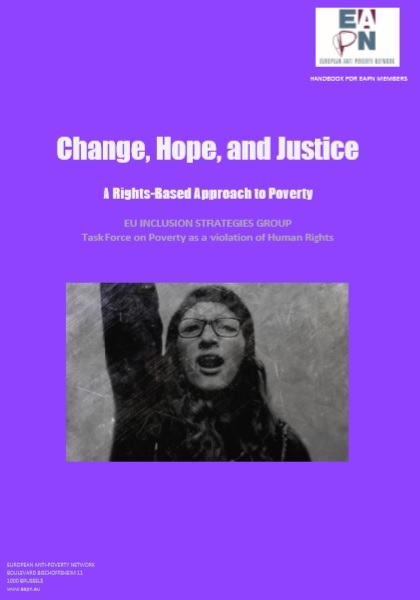 A Task Force mandated by the EU Inclusion Strategies Group to look into poverty as a Human Rights violation, finalised this Handbook in March 2018. It is aimed primarily at EAPN members, be they National Networks or European Organisations, and it aims at elaborating on the relation between poverty and Human Rights in Europe, to deepen EAPN’s understanding of poverty and social exclusion as a violation of Human Rights, and to strengthen members’ capacity to act against poverty and Human Rights violations. Explore the possibility of taking collective legal action against Governments for their failure to combat poverty and social exclusion, and hence guarantee Human Rights. The fight against poverty and Human Rights are not two distinct projects, but projects that reinforce each other. A Human Rights-based approach means that norms and principles of Human Rights law should play a major role in tackling poverty and guide all public policies affecting persons living in poverty.